The European Space Agency’s ExoMars spacecraft failed to find any traces of methane on the Red Planet during its hunt from April to August of 2018. This goes directly against recent positive reports of methane by ESA’s own Mars Express spacecraft and NASA’s Curiosity rover, which both saw methane in 2013. 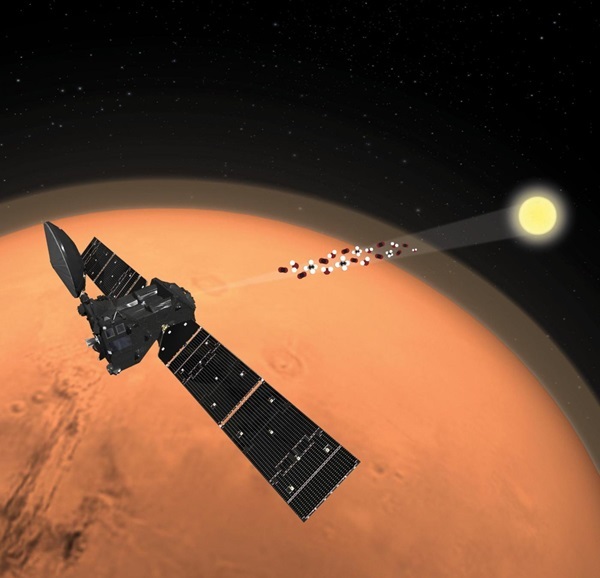 |SOURCE| ExoMars has a sensitive detector that can pick up just one-tenth the amount of methane that Mars Express witnessed. That leaves two options: either one set of observations is in error, or something happened to the methane in the intervening time. The latter option is gaining traction. Given the years-long history of conflicting methane reports on Mars, it’s looking more and more likely that the methane is real. But some unknown process or force *must be* causing it to disappear inexplicably fast. The new findings, like the old ones, make some scientists wary, especially given the possible implications of methane on Mars. It’s commonly seen as a marker for biological activity, though it can also be produced by less exciting geologic processes. But the latest conflict may simply add depth to a theory many researchers already held. The methane readings may be perfectly accurate, because the methane itself is there one day and gone the next. At the moment, that doesn’t jive particularly well with researchers’ understanding of Mars’ atmosphere. Any methane released from the surface – by any means – should last for several centuries and mix into the atmosphere, where it can be spotted by orbiting spacecraft, no matter when or where they take their readings. But even the authors of today’s findings, published in Nature suggest some unknown mechanism is removing the methane at low altitudes, before it can mix with the rest of Mars’ atmosphere and spread over any large distance. It will be up to future researchers to figure out what this mechanism is, and what substance or reaction between substances is able to remove or hide the methane from curious spacecraft studies.